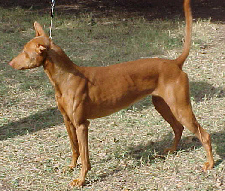 The Pharaoh Hound is a friendly, intelligent, calm, trainable, active and playful breed. It is reserved with strangers, but affectionate with its family. Has a strong hunting instinct.